In the last few years, technological developments in the healthcare sector has helped in increasing the life span of people by providing them better and effective health care. Moreover, large number of geriatric population in developed countries who are susceptible to have hearing problem due to old age has also increased the demand for this market. Nowadays, government in developing economies is also providing better and enhanced healthcare to its people. Thus, with the growing lifespan of the people is expected to drive the demand for this market. 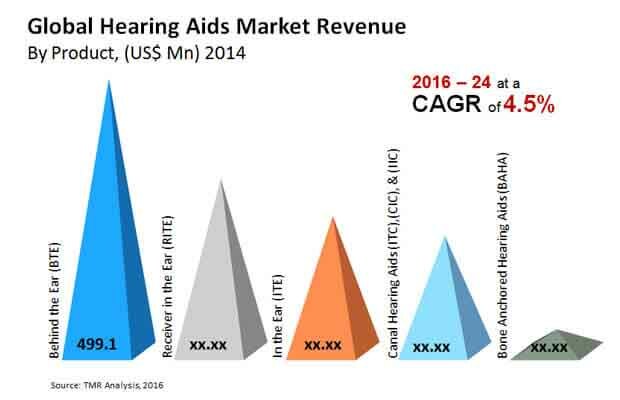 Moreover, high disposable income of consumers in developed economies and use of advanced technology in the healthcare sector is likely to benefit the hearing aids market. According to the report published by Transparency Market Research, the global hearing aids market is antcipated to rise at 4.5% CAGR during the forecast tenure from 2016 to 2024. By rising at this rate, the valuation of the market is expected to reach US$7 bn by the end of 2026. In 2015, the valuation of the market was US$4.7 bn. On regional front, Europe leads the global hearing aids market as large number of customer are capable and can afford hearing aids due to their high disposable income. Moreover, constant support and updation of medical technology has also grown the demand for hearing aids in this region. North America is also considered one of the leading players for this market, as large numbers of players are present in the region. On the other hand, Asia Pacific where several emerging economies are making efforts and are expected to drive the hearing aids market a t the global level. Top leading players in the global hearing aids market held dominated the market. In 2015, the top six players held 98% share in the global market. In addition, these players are using similar business development strategies to expand their business and strengthen their position in the market. Leading players are also investing in research and development activities to offer better product to their customers. GN ReSound, Widex A/S, Siemens Healthcare, Starkey, the William Demant Holding Group, and Sonova Holding AG are the leading players in the market. Hearing impairment has become a common phenomenon amongst the adults, primarily due to age. However, the impairment is also seen amongst children as an after-effect of certain ailments or accidents. Loss of hearing is also aggravated amongst patients due to untimely diagnosis. All of these factors have been propelling the global market across the globe. The research report on the global hearing aids market offers a comprehensive outlook of the overall market. It explains the competitive landscape present in the market along with stating the financial outlook of the companies. The research report also uses a SWOT analysis to determine the strengths, weaknesses, opportunities, and threats influencing the segments of the overall market. The global market has been flourishing at a steady pace over the past few years as the prevalence of hearing loss continues to rise across the world. Analysts anticipate that the global market will surge at a CAGR of 4.5% between the forecast years of 2016 and 2024. The incidence of poor hearing has been equally growing in both developed and underdeveloped countries. Initiatives by governments to raise awareness, competitive pricing of hearing aids, and supportive reimbursement policies are collectively expected to augment the demand for hearing aids across the globe in the coming years. In terms of geography, the global market is segmented into Latin America, Asia Pacific, Europe, North America, and Rest of the World. As of 2015, Europe held a dominant share in the global market of about 39%. The growing pool of geriatrics in region are expected to be the key consumers in regional market. The Europe market will also be supported by the soaring disposable incomes that is enabling patients to make healthcare expenditures on medical devices. North America is also shown significant contribution to the overall market as the region boasts a steady healthcare infrastructure and favorable reimbursement policies. The report also states that the Asia Pacific market will emerge as a prominent regional market. The increasing investments by public and private institutions in raising awareness about hearing disabilities, growing medical tourism industry, and improving healthcare industry will be collectively responsible for the rising Asia Pacific market at a CAGR of 5.2% between 2016 and 2024. The products available in the global market are hearing aids and bone anchored hearing aids (BAHA). The hearing aid segment, which includes products such as behind the ear (BTE), in the ear (ITE), canal hearing aids (ITC, CIC, and IIC), and receiver in the ear (RITE), is expected to lead the global market. ITE, RITE, BAHA, and canal hearing aids are projected to be popular amongst patients as they are designed to treat mild loss of hearing. The end users in the global market are adults and pediatrics. Hearing loss is primarily seen amongst adults, which will make this end user segment lead the pack. The adults held a share of about 95% in the global market in 2015. However, the report also notes that the incidence of loss of hearing is expected to be on the rise among children as well. The chief players profiled in the research report are William Demant Holding Group, Siemens Healthcare, Sonova Holding AG, the Starkey, Widex A/S, and GN ReSound.